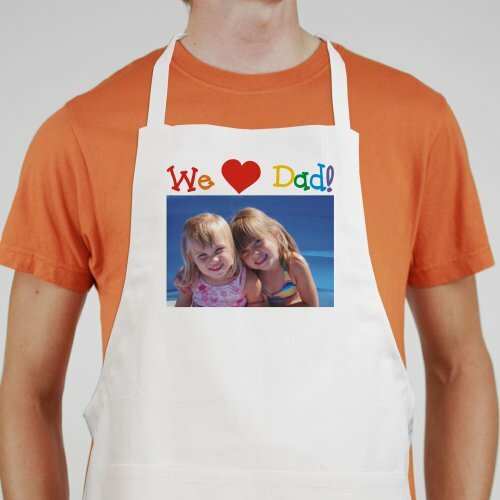 Love Photo Personalized Aprons are an excellent way to cook in style. Supply us your favorite digital photo and personal text and we will create your own Personalized Chef Apron suitable for the Culinary Minds. Our Personalized Photo Apron is a full length, 65/35 cotton/polyester twill fabric apron with matching fabric ties. Machine washable. This custom bib apron measures 20" Wide x 30" Tall and features multiple pockets for convenient storage along with an adjustable neck strap for a comfortable fit. Includes FREE Personalization! Upload your favorite digital photo below. Please don't send any photos in the mail, digital photos only. Please enter a photo description (ex. Little baby with in high chair with birthday hat) Personalize your Personalized Photo Apron with any one line custom message. Recommended pixel resolution (dpi) is at least 500 x 500. Additional Details Our Personalized Photo Apron is a perfect Mother's Day Gift or Father's Day Gift! GiftsForYouNow.com has many additional personalized photo gifts for your special gift giving needs. We specialize in beautifully personalized photo frames, personalized photo mouse pads plus much more.